0c. Real Deal Coyote Brown Drop/Dump Pouch. Don\'t be fooled by copies. This famous simple, low-profile design Dump Pouch is NOT made by SDS, HSGI, Tactical Tailor nor Blackhawk. Not even Eagle Industries. This one is made by CSM Tactical Gear. CSM is the original manufacturer of this style Drop/Dump Pouch. 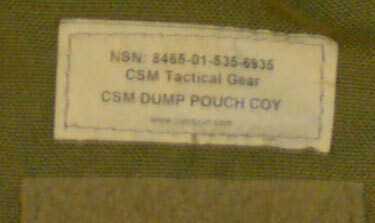 This is the genuine COYOTE BROWN dump pouch used by USMC, Marine Recon and other Special Forces personnel. This pouch has NSN number. NSN# 8465-01-535-6935. Made in USA.